When I was trying to find a place to base my Vegas operations, one property kept popping back up as the perfect setting: the Veer Towers, part of the disastrous CityCenter project that serves as the last vestige of the megacasino era. No place serves as a better representation of broke, beautiful Vegas. When the Mirage actually opened its doors to the public in November of that year, its management reportedly needed to take in a million dollars per day to pay off the developer’s loans. There were concerns that the Mirage could be bankrupt within weeks. Instead, the shiny, well-lit casino heralded a huge boom in Vegas construction. Since the opening of the Mirage, 15 new casinos have been built on the Strip. Virtually every one of them follows the pattern created by Wynn. The only casino older than the Mirage still competing with the developments from the megacasino era for high rollers is Caesars Palace. The building boom peaked when MGM announced its CityCenter project in 2004. Designed to be a 67-acre “city within a city” with a combination of condominiums, hotels, shops, and a massive casino, the project was financed with the help of the Dubai government to the tune of $4 billion. That made it the largest privately financed project in American history. By the time CityCenter opened in 2009, the project’s cost had ballooned to more than $9 billion. Today, the properties in CityCenter are stunning and mostly vacant. While the one casino on-site — Aria — produces gaming revenue, the frothing demand for hotel rooms disappeared with the collapse of the American economy. The condominiums MGM counted on to immediately finance the property now sit empty. The 49-story Harmon Hotel, which was expected to hold 200 condos and 400 hotel rooms, was found to be structurally deficient and never actually opened. The building is now naturally the subject of lawsuits and has been designated for demolition by MGM. It currently serves as the most expensive billboard in the history of Las Vegas: a $279 million tax write-off that reportedly could collapse in an earthquake. I live next door to that potential disaster zone. As a place to live, the Veer Towers are a gorgeous property. For less than the cost of most one-bedroom apartments in Boston, I have a place on the 33rd floor that looks over the Monte Carlo and Mandalay Bay, with the mountains of Vegas in the distance. I was lucky to get a place in the West property that faces away from the sister tower — according to residents who live in the section of the East tower that faces west, the building is subject to a loud, sustained whistling noise that occurs any time the desert wind whips past the building. This sound makes living in the apartment impossible and forces MGM, who still owns the building, to put any resident who complains in the adjacent Vdara Hotel & Spa for a free stay. The estimate I heard for how many times this has happened in 2011 was in the mid-20s. It’s terrible timing for most people, but it’s a great moment for me. 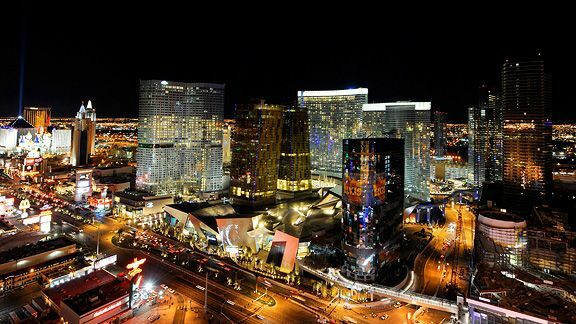 I can rent at a fraction of what MGM expected the units to go for and live in the heart of the strip, with a two-minute tram ride taking me to the elite poker rooms and sportsbooks of Aria and the Bellagio. There are a half-dozen casinos within a short walk. It’s the epicenter of my Vegas experience, the control tower from which I will hand out money to casinos like a mobile ATM. This week, I’ll be focusing on another football betting opportunity. We’ll look this week at the full-season bets for the MVP award.1 Most Nevada sportsbooks don’t take action on this, but you can find action in the always murky world of offshore sportsbooks. Like most futures bets, especially those focused on individual players, MVP odds can be difficult to gauge and should mostly be utilized as a fun way to project player performance. We’ll be using the lines set by Bodog. During the 2008 season I looked back at the history of MVP voting since the Moseley Aberration2 for ESPN the Magazine and found that there were three simple rules for identifying the MVP winner before the vote took place. They’re not complex: You need to win your division, score the most fantasy points of any player at your position, and, if you’re not a quarterback, you need to run for 2,000 yards or set a record. Nobody’s consciously voting on the strength of a player’s fantasy points, but those three criteria have historically been great indicators of the players for whom people actually do end up voting. In that 2008 season nobody fit those rules, so Peyton Manning won. Otherwise, those three rules have been followed by just about every MVP winner over the past 30 years. Aaron Rodgers (11/2): Rodgers was clearly the best player in the playoffs on a dominant Super Bowl-winning team, and with Green Bay likely to be healthier this season, he could be the starting quarterback on a team that wins 12 or more games. As a word of caution: Drew Brees was favored at 5/1 last year for the same exact reasons and received exactly zero votes. Green Bay should be more effective running the ball this season, which could mildly depress Rodgers’ raw statistics. He’ll face a tough schedule of pass defenses, starting with three excellent units in New Orleans, Carolina (really), and Chicago. His nondivision schedule includes games against likely tough pass defenses such as Atlanta, Kansas City, San Diego, and the New York Giants. PASS: As good as Rodgers is, 11/2 overvalues him. Actually, it’s hard to imagine that any player would be worth 11:2 odds. Tom Brady (13/2): Another MVP would make Brady just the fifth player in the history of the award to repeat (joining Jim Brown, Joe Montana, Brett Favre, and Peyton Manning), but he’s unlikely to put up the same gaudy numbers that he put up in 2010. His ridiculous interception rate — four interceptions in 492 attempts — is sure to regress towards the mean. In other words, his interception rate has about as much of a shot at returning to the NFL this season as Jada Pinkett Smith’s metal band does of returning to Letterman. No one in the history of the league has been able to sustain a rate anywhere close to that figure over multiple seasons. Those extra interceptions will depress his statistics while creating opportunities for the opposition. His schedule is tougher than Rodgers’, too, as Brady gets two games against the Jets, road games against the Eagles and Steelers, and home tilts against the Chargers, Giants, and Chiefs. This isn’t going to happen. PASS: The electorate has never shown the ability to account for strength of schedule in player voting. Brady himself didn’t get any attention in 2009 while playing one of the hardest schedules in league history. This one might be harder, so he’s a tough bet with odds even twice this high. Peyton Manning (15/2): While there’s no reason to believe that Peyton Manning is going to miss even a single meaningful snap of the 2011 season because of his neck injury,3 it’s certainly possible that Manning could go through a portion or all of the season at less than 100 percent. Even if he was healthy, there are danger signs: He is 35 years old and playing in a division in which the two dreadful pass defenses of 2010 — Houston and Jacksonville — are likely to be much improved for 2011. He also threw 679 passes last season, which was nearly 20 percent more than his career average for pass attempts per season. He won’t throw that many again, and a drop in attempts means a drop in yardage and touchdowns. His best hope is that the division doesn’t improve on defense and the Colts go 13-3 in a rare healthy season. PASS: Although the bet itself isn’t terrible because of the longer odds being provided for Manning, the rest of the league’s elite quarterbacks have caught up to him statistically, and the division may have caught up to the rest of the Colts. Michael Vick (17/2): He feels undervalued here. You don’t need me to tell you that Vick is going to make a ton of big plays, and he’s going to be doing it on a team that’s built to win this season. (He also has five games scheduled for national television, more than Brady or Manning and as many as Rodgers.) If the combination of the Eagles’ record and Vick’s numbers are even in the same ballpark as the figures produced by the other favorites, Vick will win on sheer highlight value. Vick’s 1.6 percent interception rate is unsustainable and almost surely going to increase, but the correction isn’t likely to be as severe as Brady’s. The only other thing stopping Vick is his propensity for injury. A Vick win would make for the best story amongst all the prominent candidates, something that needs to be considered when a group of writers vote on anything. He’s the best bet among this foursome of favorites. BET: Although Vick isn’t the best bet available, all he needs to do is stay healthy on a team that should be the best in the NFC. The respective odds on Vick and Rodgers suggest that Rodgers is nearly 50 percent more likely to win the MVP than Vick. Their chances are far closer to even. Get your friends to lay you Vick at those odds versus Rodgers and laugh all the way to the bank. Chris Johnson (16/1): A lot of things have to go right for a running back to win MVP. He has to stay healthy. He has to play for a team that wins a lot, affording him a high number of touches in the process. He needs a healthy, effective quarterback to keep the safeties out of the box against him. And after all that, he needs to do something transcendent by running for 2,000 yards or setting the touchdown record. Chris Johnson had way more of these checkboxes filled in in 2009 and didn’t receive a single vote. Now, as a holdout on a middling team, he’s the seventh-favorite choice? The Raiders’ cornerback — the other Chris Johnson — might have a better shot at winning this award. And he just had secret surgery. Mark Sanchez (25/1): Mark Sanchez probably has a better shot at being benched at some point during the 2011 NFL season than he does at winning the MVP award. The late-game heroics from last season against the Texans and Colts are certainly intriguing and worth celebrating, but at his core, Sanchez is still an erratic quarterback on a team with a great running game and defense. Football Outsiders also noted that Sanchez led the league in dropped interceptions last season with 15. The 2009 leaders in dropped interceptions were Brett Favre, Tony Romo, and David Garrard. Their interception rates each doubled last season. This is just about as smart as putting your life savings on green for one spin of roulette. Matt Cassel (28/1): You’re undoubtedly sick of the unsustainable interception-rate drum beat by now, but Cassel isn’t throwing picks on 1.6 percent of his passes again. Cassel has benefited from two historically easy schedules in three seasons as a starter, and, unsurprisingly, he was gruesome in the one year (2009) when his schedule wasn’t difficult. In 2011, he replaces the four games he enjoyed against the NFC West in 2010 with four against the NFC North. The 2010 matchups against the Bills and Browns have been swapped out for the Steelers and Jets. Like Sanchez, he has a better shot of being benched than winning MVP. If Sanchez was putting your money on green, Cassel is like putting your money on red and then lighting the roulette table on fire before the ball gets spun. LeSean McCoy: McCoy has been healthy so far as a pro, and the Eagles seem like a pretty sure thing to win nine games or more. The combination of Michael Vick and DeSean Jackson should keep safeties a good 20 yards downfield. In fact, Vick’s an incredible boon to McCoy’s productivity, as Shady averaged 5.9 yards per carry with Vick in the lineup and 3.8 yards a pop otherwise last season. The Eagles won’t give him the 350 carries he needs to hit 2,000 yards, but as the primary back in the league’s most explosive offense, 20 total touchdowns wouldn’t be outside the realm of possibility. If none of the quarterbacks stand out, thereby splitting the obligatory QB vote, and McCoy becomes a touchdown machine on a 12-4 team, he could take home the trophy. Kevin Kolb: Of course, the jury remains out on whether Kolb is even a viable NFL starter at quarterback, let alone someone with the talent to win an MVP award. But think about the criteria you’d want to look for in a surprise MVP candidate, somebody like Kurt Warner in 1999. Because quarterbacks win virtually all of the awards, it would need to be a quarterback; there’s no historical precedent for an out-of-nowhere running back like Terrell Davis or Arian Foster sniffing an MVP award during their breakout year. Eighteen of the league’s 32 starting quarterbacks are already listed with odds on Bodog, and besides Kolb the best unlisted quarterbacks are probably Kyle Orton, Donovan McNabb, or Vince Young. Not exactly compelling. Ideally, you would want the quarterback to enter into a great offense with a weak schedule and no competition. Kolb’s the clear man in Arizona, he gets to play against the NFC West, and, while nobody’s mistaking the Cardinals for the Greatest Show on Turf, Kolb gets to throw to Larry Fitzgerald. Kolb’s preseason numbers (10-of-18 for 148 yards with no touchdowns) haven’t been very impressive so far, but Warner wasn’t spectacular during the preseason in 1999, either, as he was 31-of-51 for 362 yards with no scores in four games. It’s unlikely, of course, but of the long-shot quarterbacks Kolb has to be the best positioned for a fairytale story. ClayMarcus Woodiams: Yes, by combining the names of four outside linebackers into one super-pass-rusher, we’re cheating. But if any defensive player is going to win the MVP award, it’s going to have to be a pass-rusher. The Nnamdi Asomughas and Darrelle Revises (Revii?) of the world may singlehandedly transform pass defenses with great coverage, but elite cornerbacks don’t compile the statistics needed to impress voters. Michael Strahan set the single-season sack record with 22.5 takedowns in 2001 and didn’t sniff the MVP. (To be fair, he was playing on a 7-9 team.) With offenses passing more frequently than ever, pass-rushers simply have more chances to pick up sacks than the guys from 10 or 20 years ago. And if Clay Matthews or LaMarr Woodley somehow got to 25 sacks (or even approached 30) on an 11-win team, wouldn’t they have to get consideration for MVP? Philip Rivers (10/1): The team with the best odds of winning its division, according to the market at BetUS, is the San Diego Chargers. While they were waylaid by dismal special teams last season, there’s simply no historical precedent for a special teams unit being that bad in consecutive seasons. San Diego’s Pythagorean projection suggests that it was really an 11-5 team last year masquerading at 9-7. Rivers, meanwhile, put up fantastic statistics while getting a total of just 15 combined games from his two best receivers, Vincent Jackson and Antonio Gates. They’re both back, and running back Ryan Mathews should be much better in his second season. If the Chargers go 13-3 in an easy division and end up with the best record in football, Rivers would be an MVP favorite by merely maintaining his previous level of performance, let alone improving on the 2010 line he put up with throws to Seyi Ajirotutu and Kelley Washington. Actually, the Associated Press National Football League Player of the Year and/or Most Valuable Player Award. There is no official MVP award given out by the NFL itself. This came in handy last February, as it would have been rather embarrassing to see Roger Goodell award the MVP trophy to the first player willing to cross a picket line. In the strike-shortened season of 1982, Redskins kicker Mark Moseley won the MVP award. He was 20-of-21 on field goals, but the Redskins converted just 16 of their 19 extra points that season, the third-worst percentage in the league. This is commonly referred to in modern textbooks as the best historical argument against democracy. Bill Polian lies to the media about injuries for sport. This is actually a category in the underground NFL general manager fantasy league. You know how the Patriots keep bringing every veteran of any note in for a tryout before passing on them? That’s another category.